The legendary female warriors, the Amazons, founded Izmir, or Smyrna as it was called in Ancient Times, according to one story. Alternatively, according to another tale, the Lelegs established it. The city is located on the Aegean Coast in the west of Turkey, and the city is the biggest and most important settlement in the Aegean Region. Izmir, which has managed to modernize whilst preserving its archaeological and historical assets, is an important trade centre, because of its port. 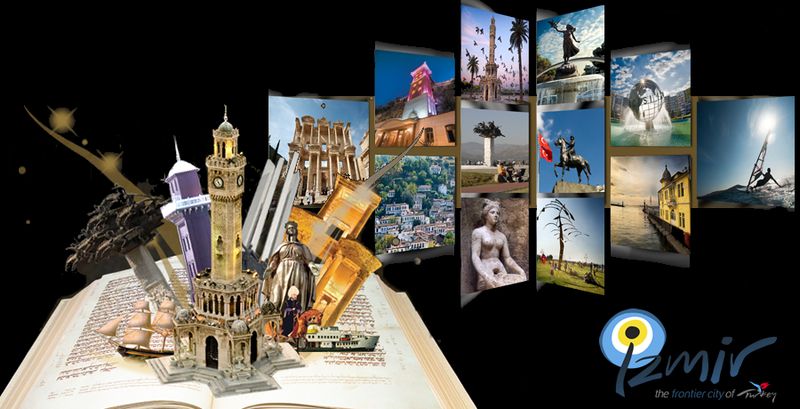 The diversity of activities and resources that Izmir is able to provide makes it a very attractive area for tourism. It boasts both spas with healing thermal waters, and the deep blue sea with beaches displaying the safety symbol of the blue flag. Summers, due to Mediterranean climate in the region are hot and dry, while winters are warm and rainy. The temperature rarely drops below zero in the winter months. This temperate climate means that for most of the year it is a good place for outdoor pursuits and water sports. Bergama: Bergama (Pergamum), which was one of the main centres for culture, architecture and sculpture of the Hellenistic world, lies in the north-western Aegean Sea, located about 107 km from the city centre of Izmir and 30 km from the sea coast. Bergama displays structures from the Hellenistic, Roman, Byzantine and Ottoman periods, as well as the prehistoric period. The first settlement of the town began in Acropolis (upper city). The Acropolis of Pergamum was equipped (197-159 BC) with the finest works of the period during the reign of Eumenes II, and it became one of the major cultural, architectural and sculpture centres of the Hellenistic world. The major buildings in the city are the Temple of Athena, the Trajaneum, theatre, library, Heron, the Altar of Zeus, the Temple of Dionysus, the Agora, the castles and the arsenal. Asklepieion, dedicated to the god of health Asclepius and also one of Apollo's sons, was one of the most important health centres in the area. The presence of a library at the place where spiritual healing, water, sleep, and physical therapy have been used shows that academic studies also were conducted. The baroque reliefs and pathetic figures of the Altar of Zeus, which are regarded as masterpieces of creative genius, inspired later works such as the "Laocoon sculpture." The reliefs were partially removed from the altar, taken to Germany and are now exhibited in Pergammon Museum in Berlin. Konak Square: Throughout history, Izmir has been a port city and Konak is the city centre of Izmir. Following recent restorations this area has also been turned into a recreational centre, and thus is now a lively spot throughout the day. In the square can be seen: - the monumental statue of Hasan Tahsin, who fired the "first bullet" at the occupation forces during the War of Liberation, the Yah Mosque decorated with tiles from Kütahya, the Clock Tower, the Municipality Building and the Governor's Office. Governor's Office: Built between the years 1868 and 1872. The Turkish flag, raised at the Governor's Office, marked the arrival of the Turkish army on September 9, 1922. This event symbolized the liberation of Izmir, giving this location particular importance. Clock Tower: Izmir's century-old symbolThe Clock Tower, which is a symbol of Izmir, is located at Konak Square, and is a favourite meeting p lace for today's residents of Izmir. The Clock Tower was designed by the Levantine French architect, Raymond Charles Pere in 1901 in commemoration of the 25th anniversary of the ascension of Abdülhamit II. In the construction the use of iron and lead elements between the cut stone meant that the tower was rendered earthquake resistant.The clock in the tower was a gift from Kaiser Wilhelm II of Germanyto Sultan Abdülhamit II of the Ottoman Empire as the symbol of their personal friendship besides the Turk-German friendship. The fountains located on all the four corners of the wide chamber under the Clock Tower have also given the tower the characteristics of a "şadırvan" (fountain used for ritual ablutions and usually located in the middle of a mosque courtyard). Another feature of the tower is the city gas installation built inside it. In the past, this was used as a lighting source at night and in the evenings. Bayraklı / Smyrna: The history of Izmir was re-written as a result of the excavations carried out by the Archaeological Department of the Aegean University in the District of Bornova in the 2000's. Significant artefacts such as reliefs and small statues of animals, arrows made from flint stone, short handled spoons made of fired earth and seals with labyrinth motifs were unearthed particularly at Yeşilova Höyüğü (Mound) and classified as dating back to the Neolithic Period. These are very recent historical developments for Izmir, and these finds have proved that the city had been a continuous settlement for 8500 years. The second most well known ancient settlement in Izmir is located at a place currently called Bayraklı Tepekule, and dates back to 3000 B.C. Bayraklı, which was under water in Ancient Times, was built on a peninsula extending out towards the Gulf of Izmir. Bayraklı at that period exhibited contemporary characteristics with Troy I and II. Megaron-style, rectangular designed houses dating back from the 10th century B.C. to the 7th century B.C. in the settlement where proto-geometric pots were unearthed have the characteristics of the Archaic Period. Kadifekale: Taking a bird's eyes view of Izmir and the port, Kadifekale, which was called Pagos in Ancient Times, has the characteristics of an acropolis due to its position at an altitude of 186m. The ruins of walls on the western and southern parts, comprising of five towers, date back to the period of Lysimachus, one of the generals of Alexander the Great. The settlement in Izmir was re-located to Kadifekale from Bayraklı in the period that followed the arrival of Alexander the Great in Anatolia in 334 B.C. According to the geographer Strabo, the urban core of Izmir, which was one of the 12 most beautiful Ionian cities, extending from Kadifekale to the port, comprised of streets paved with smooth stones, a temple dedicated to the mother goddess and Homer, a theatre, agora, which was a lively trade centre, a stadium, grain warehouses, water cisterns and aqueducts. Agora, etymologically, means "city square, shopping centre, market place". At the heart of all trade. Agora with its open vaulted three-walled porches, monuments, altars and statues had commercial, judicial, religious and political functions besides it was a venue for intensive artistic activities. It was also the place where the foundations of philosophy were laid. The agora located in the District of Namazgah in Izmir dates back to the Roman Period (2nd C. A.D.), and according to the grid planned Hippodamos model, it was built on three floors at a location near the centre. Of all the Roman Agorae, the Agora in Izmir is the largest and best preserved. It is understood that the Agora in Izmir was a composite structure in a rectangular form, built on arches and surrounded by columns with a central courtyard; it has three floors and a staircase in front of it. It is also understood that the relief of the Goddess Vesta at the northern gate of the agora is an extension of the reliefs from the Zeus Altar unearthed in the initial period of excavations. In addition to some statues of various gods, namely Hermes, Dionysus, Eros and Heracles, many artefacts including statues of men, women and animals, reliefs, figurines, marbles, bones, glasses, metal works and articles made of fired earth were uncovered. The newly unearthed inscriptions provided information about the people who assisted the city during an earthquake which occurred in Izmir in 178. Kemeralti is a historic bazaar covering an area extending from the Neighbourhood of Mezarhkba§i to Konak Square. Anafartalar Avenue, that constitutes the main street of the bazaar, forms a wide curve. This curve stems from the fact that the street once surrounded the perimeters of the internal port, which existed in previous centuries. As in the past, Kemeralti Bazaar is a major shopping centre in Izmir today. The bazaar, having an outdoor and indoor section, offers visitors a rich variety of products and services ranging from traditional Turkish handicrafts like ceramics, tile panels, wooden products, copper, carpets, rugs and leather products, to delicious Aegean foodstuffs. building until the mid-20th century. Famous for its steel construction, this structure has been restored and re-designed as a modern shopping and recreational centre. There are restaurants, cafes, cinemas, and about 50 stores in a 20,000 mz area of this centre which was re-named the Konak Pier. Kordonboyu (LKordon) is just like a pearl necklace running along the coast in the District of Alsancak, enjoying the popularity it has received for providing the inspiration for many poems and songs. 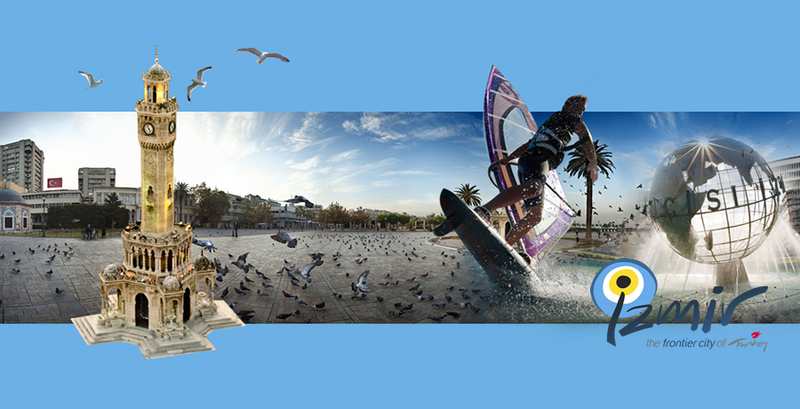 It offers romantic sunsets, sea breezes, cafes, fish restaurants,stylish stores, parades, running and biking courses. It also provides an ideal atmosphere for entertainment and recreational activities, bringing together the people of Izmir. Donertas Fountain: Located in Basmane-Donertas. Donerta? Fountain was named after the rotating column in the corner, and the area in the vicinity is called by this name. It was built at the beginning of the 19th century, with a single dome and a square plan. The fountain is one of the most beautiful examples of the Turkish baroque style. Of particular note are the bouquet vase and the fruit bowl compositions, the relief decorations on the marble, with a theme peculiar to the Tulip Age. As decorative elements, tulips, roses, flower buds, leaves, branches and other similar plants have been used. The structure is one of the best examples of fountain architecture in Izmir. Asansör: The Asansör (lit. elevator) Building, which was constructed by the Jewish businessman Nesim Levi in 1907 to facilitate reaching the upper part of Mithatpaşa Street, is one of the interesting tourist spots in Izmir today. This aesthetically designed building is recognized as one of the indispensable social structures in Izmir. Kızlarağası Han (Inn) was built by Hacı Beşir Ağa in 1744 to serve the public. The inn, one of the rare works of Ottoman architecture in Izmir that has survived until the present day, has the design of other Ottoman inns, with bazaars and courtyards. Kızlarağası Han is a glorious structure with its rectangular plan, two-storey "bedesten" (vaulted part of a bazaar where valuable goods were kept) and courtyard. Following restoration in recent years, it has become an authentic shopping and social centre in Izmir. Cakaloglu Inn: Located opposite the Kizlaragasi Han. It was built in the 19th century. Cakaloglu Han is distinguishable from other inns nearby by the architectural features peculiar to it. Yali (Konak) Mosque: Yali (Konak) Mosque at Konak Square, built in the 18th century, is noteworthy for its tiles and octagonal plan and is one of the most elegant mosques in Izmir. The mosque decorated with turquoise tiles blends in totally with Konak Square and has become the second symbol of Izmir after the Clock Tower. Hisar Mosque: Located adjacent to Kizlaragasi Han in Kemeralti is one of the biggest mosques in Izmir, Hisar Mosque, built in 1597. The mosque was built of cut stone. The interior decor displays many beautiful examples of the Ottoman Decorative Arts. Kestanepazan Mosque: Built in 1667, the mosque comprises of a large dome on a square space and four domes surrounding it. It is rumoured that its magnificent mihrab (niche in a mosque wall indicating the direction of Mecca) was brought from tsa Bey Mosque in Selçuk. Şadırvan Mosque: The mosque, which was built in 1636, was named after the şadırvans (fountain used for ritual ablutions and usually located in the middle of a mosque courtyard) located adjacent to and below it. It was repaired in 1815. The mihrab (niche in a mosque wall indicating the direction of Mecca), minber (pulpit beside the mihrab reached by a long, straight flight of steps) and sermon place of the mosque are all made of marble. On its eastern side, the mosque has a minaret with a single şerefe (balcony) and on its western side it has a library. Salepçioğlu Mosque: This mosque was built by Salepçizade Hacı Ahmet Efendi in 1906. It has a large dome and its exterior walls are made of marble and green stones. One of the most precious mosques in Izmir, the six-compartmented Salepçioğlu Mosque is architecturally elegant. Kemeraltı Mosque: Built by Yusuf Çavuşzade Ahmet Ağa in 1671, the mosque is one of the most significant historical works in Izmir. The worship area has a single dome and a square plan and its minaret is located in the west. There is a madrasa (theological school attached to a mosque), a library and a sebil (kiosk built for the dispensing of free water as an act of piety) surrounding the mosque, noteworthy for its gypsum decorations. Built with the permission of Süleyman the Magnificent in 1625, this church is the oldest church in Izmir, which is still in service. The interior, famous for its glamorous frescoes and wall decorations, depicts the killing of Saint Polycarp, the protective saint of Izmir, by the Romans in the ancient stadium at Kadifekale. Architect Raymond Charles Pere, a native of Izmir, who restored the frescoes in the 19th century, depicted himself as someone watching the event helplessly with his hands tied. Mary Pere, the daughter of Charles Pere, is depicted as the child Mary in the scene "The Saint Mother and Child Mary" on the sidewall of the northern nave. Church of St. John: Construction began in 1862 and services started in 1874. The main altar was a gift from Pope Pius IX. It is known that in 1863, Sultan Abdülaziz, the then Ottoman ruler, donated a large sum of gold for financing the construction of this church. Both Protestant and Catholic American communities presently use the church. Church of Saint Helen: Located in the District of Karşıyaka bearing the signature of Raymond Charles Pere, the Church of Saint Helen is the most monumental example of recreating the Gothic style. The church was built on a plot of land donated by the Levantine Aliotti family following permission by Abdülhamit, the Ottoman Emperor of the time. Synagogues: The synagogues in Izmir are mainly located in an area adjacent to the Neighbourhood of Namazgah. This area is also the settlement place for the Jewish community. The Jews, who settled in Izmir in 1492 and the ensuing years created their own settlement in a manner similar to the one observed in other cities, with each such group opening a sanctuary. Street No 927 at Mezarbkbaşı is also known as Havra Sokağı (Street of Synagogues). The street is called by this name because of the amount of synagogues in the vicinity. Beth Israel Synagogue: Since the Jews in Izmir were relocated to the neighbourhoods of Göztepe, Karantina and Karataş towards the end of the 19th century, the Beth Israel Synagogue, the largest one in Izmir, was built in Karataş Neighbourhood upon an order by Sultan Abdülhamit II, the Ottoman Emperor of the time, on March 15,1905. The interior decoration of the synagogue, which began service in 1907, was an ongoing process, achieving its present condition in the 1950's. The wooden decorations made of solid mahogany are the works of the famous masters of the period. The synagogue was designed to hold 600 people, with its lower floor exclusively for men and the upper floor for women. It is a favourite spot for religious celebrations like the wedding ceremonies and Bar Mitzvahs. Algazi Synagogue: It was built by the Algazi Family in 1724, and is the largest synagogue after the Beth Israel. It is open for services on Jewish religious days. Stepping into the past in Izmir Archaeology Museum, Ataturk Museum, Kordonboyu and Kemeralti Bazaar. Tasting Izmir's famous meatballs in the Asansor Restaurant. Visiting the International Izmir Festival. Bars and restaurants are lively when evening comes and night falls that it is not surprising to see new hot spots opening all the time in the Karşıyaka, Bostanlı and Inciraltı neighbourhoods, where there are opportunities to relax after a hard day, enjoy lively conversation and share dinner with friends. Restaurante, cafes, bistros and bars where select dishes from Turkish and international cuisine are served, will make for a lively social life. More modest spots addressing more local tastes are mostly located in the Konak, Kemeralti, Bornova and Balçova neighbourhoods. In particular, Kordonboyu is one of the liveliest spots in Izmir, reflecting the colours and glitter of the night... Visitors are recommended to visit a café at Kordon and experience the ambience there. They can feel the spirit and have a genuine taste of local life in Izmir. Izmir Bird Heaven: Izmir Bird Heaven is one of the few watery areas in the world. In Gediz Delta, you can see 250 different types of bird species throughout the year. At the same time, Delta is, after the Salt Lake, the most important reproduction area for the Flamingo's; in every region of Delta, even in Izmir bay, you can come across with flamingos. Homa Lagoon in Gediz Delta, which is adjacent to the Çamaltı salt-marsh, shelters a variety of biological life. Gediz Delta, who is related to the Ministry of Environment and Forestry of the Republic of Turkey, is certainly a must-see place. izmir-geo: Izmir resonates with the water and the wind. Benefiting from the breeze from the Aegean Sea, Izmir enjoys a well-deserved reputation due to sights and ruins such as Bergama (Pergamon), Çeşme, Foça, Kemalpaşa, Selçuk, Tire and Urla, which are outstanding in terms of the richness of their natural and historical assets. Archaeology Museum: The first archaeology museum in Izmir was opened to visit in 1927 at Ayavukla (Gözlü) Church in the district of Tepecik. The second museum was founded in 1951 at the Culture Park. However, since the region is very rich in terms of archeolgical sites, both museums were insufficient and a new and modern museum was needed. It was established on a 5000 sqm area in Bahribaba Park in Konak on February 11th, 1984. The museum was designed to meet any kind of needs with exhibition halls, laboratories, warehouses, photography rooms, libraries and conference halls. The number of monuments on display in the museum building and in the garden is more than 1500. The entrance floor of the museum is devoted to the exhibition of significant archaeological monuments found during the excavations of Iasos, Pitane, Bergama and ancient Smyrna. Busts, portraits and statues dating back to the Archaic, Hellenistic, Roman and Byzantine periods are displayed here. The hydrias of Hellenistic period, glassware, coins and a bronze Demeter statue are among the significant assets of the museum. On the enterance, the marble statutes are exhibited. Artemis temple: The famous Artemis temple, one of the 7 wonders of the world is in Efes (Ephesos) Selçuk, Izmir. It is known as Astemision too. The temple was first built by the Lydian king Kroisos in Ion form during 560-550 B.C.. After burnt by a madman, it was rebuilt in 356 B.C. in same size but with a height of 3m. The temple, famous with its marble sculptures was the biggest temple of the Hellenistic period with a dimension of 55.10 x 115 m. It was not reconstructed again after being collapsed by the Gots in 262. The remains of the temple found in the archaeological excavations done by J.T. Wood during 1869-1874 and David G. Hogart during 1904-1905 in the name of British Museum, were removed to England. Izmir - Ataturk Museum: The building is in Izmir, I. Kordon (Ataturk Boulevard) built in between 1875-1880 by a carpet merchant, Takfor, as a resident. It was nationalized after abandoned by its owner on 9 September 1922. After entering Izmir, the Turkish Army used the building as its headquarters. During Izmir Economy Congress Meeting, which started on 17 February 1923, Ataturk carried out his private studies in this building. After the Congress, headquarters were moved from this building and the Treasury leased it to Naim Bey to be used as a hotel. During their visit to Izmir on 16 June 1926, Ataturk and Ismet Pasha stayed in this hotel named as Naim Palas. On 13 October 1926 Izmir Municipality purchased the building and after refurbishing it presented to Ataturk as a gift. During his visits to Izmir between 1930 and 1934, Ataturk always stayed in this residence. After Ataturk's death on 10 November 1938, the building was inherited by his sister Makbule Baysan. On 25 September 1940 Izmir Municipality expropriated the building in order to convert it to a museum. On 11 September 1941, on the 19th Anniversary of Ataturk's arrival in Izmir, the museum was opened to public with an official ceremony. After 5 October 1962, the museum has been named 'Ataturk Provincial Public Library and City of Izmir Ataturk Museum'. On 25 December 1972, by the decree No. 12088 of the Undersecretary of Cultural Affairs of the Prime Minister's Office, the proprietorship of the building transferred to Izmir Archeological Museum. After restorations and refurbishment, it was reopened on 29 October 1978 as 'Ataturk and Ethnographical Museum'. On 13 May 1988, the ethnographical items that were in display in the building, were moved to the new Ethnographical Museum. After that it was renamed as 'Ataturk Museum'. The building is a Neoclassic style, a mixture of Ottoman and Levantine architectures. A four-storey masonry building, including the basement floor and the attic, has a rectangular plan and covers 852 square metres. It has a courtyard and a porch at the rear, and bay windows on the first floor at the front. The ground floor is paved by large marble tiles and the hall is covered by a 34.5 square metres carpet from Usak. In the left and right niches there are marble statues, a large crystal mirror and, an Ataturk bust. In the rooms at both sides and in the small living room beautiful XIX. Century style fireplaces are quite eye-catching. Two bronze knight figurine appliques are on the wall at the head of the staircase leading to the upper floor. A big size Ataturk portrait is hanged in the stair hall. The first floor was for Ataturk's private use; meeting room, study room, bedroom, guest room, barber's room, guard's room, waiting and reception room, library, dining room and the bathroom. In the meeting room, a roulette table with green broadcloth and 12 Cosmos brand chairs around it, are placed in the middle. Ten small mahogany chairs all along the walls have china plates at their backs with scenes from Shakespear's works depicted on them. A mahogany bedstead, two commodes, two velvet armchairs, one couch, one chaise longue, one marquisette and three wardrobes are in the bedroom. The bedroom is furnished with the fashion of its time. There is a French encyclopaedia in the library. An oak veneered study table, with Ataturk's writing set on it, is in the study room. All the rooms are decorated with twisted bronze statues, vases and oil paintings. The floors are covered with precious carpets from Isparta and Usak provinces. The first establishment of the antique City of Ephesus within the boundaries of Selçuk district of Izmir province dates back to 6000 BC, to the Neolithic age. During the researches and excavations, settlements from the Bronze Age and Hittite period were found in the tumuluses around Ephesus (pre-historic tumulus settlements) and on the Ayasuluk Hill where the castle stands. During the Hittite period the city was named as 'Aphasas'. The harbour city Ephesus where also immigrants from Greece settled moved to the neighbourhood of the Artemis Temple in 560 BC. Ephesus which is being visited by many tourists today was founded by Lysimakhos, one of the generals of Alexander the Great in the year 300 BC. Ephesus which experienced its most glorious days during the Hellenistic and Roman Ages had a population of 200.000 as the capital and the biggest harbour city of the Asian province. Ephesus changed place during the Byzantine period again and moved to the Ayasuluk Hill in Selçuk where the antique city was originally found. Ayasuluk which was invaded by Turks in 1330 and became the centrum of Aydınoğulları started to get smaller and was given the name Selçuk after the foundation of the Turkish Republic in 1923. Today it is a touristic place with a population of 30.000 people. The remains of Ephesus are situated in a large area since the city changed many places throughout its history. Many excavations, restorations and reorganizations have been carried out within the remains spread over an area of about 8 km², and it is open to tourist visit. Having been an important centre of civilization in the Antique Periods, Ephesus is one of the leading tourism centres today with an average 1.5 million visitors annually. The first archaeological excavations in Ephesus were initiated by J. T. Wood on behalf of the British Museum in 1869. D. G. Hogarth continued Wood's researches aiming at finding the famous Temple of Artemis as of 1904. Austrian excavations in Ephesus which are continuing today were initiated by Otto Benndorf in 1895. Excavations carried out by Austrian Archaeological Institute which were suspended due to 1st and 2nd World Wars resumed in 1954 and have continued without interruption. Besides researches of Austrian Archaeological Institute, The Ephesus Museum has also been carrying out excavations, restorations and reorganizations in the site in the name of the Ministry of Culture and Tourism of the Republic of Turkey since 1954. Thanks to the research over 100 years, on the one hand scientific results which have brought new dimensions to the Ephesus History and Anatolian archaeology have been obtained; on the other hand buildings and monuments unearthed during excavations have been restored and redesigned along with their environment. Çukuriçi Tumulus: It is located in the southwest of Magnesia gate. The remains found show that prehistoric settlements dating back to 4000 BC have been unearthed. Ayasuluk Hill Excavations: Have been carried out in the southeast hillside of the castle. The findings show that the tumulus dates back to 3500 BC. The Ephesus Museum, which is responsible for archaeological research, reorganization, supervision and protection on behalf of the Ministry of Culture, is one of the most important museums in Turkey not only with the works from Ephesus and nearby places belonging to Mycenaean, Archaic, Classic, Hellenistic, Roman, Byzantine, Seljuk and Ottoman periods, but also with cultural activities and capacity of visitors. Having been found as a storehouse after the excavations in Ephesus in 1929 and expanded with an additional building in 1964, The Ephesus Museum was improved by means of changes in exhibitions and new additions. Since The Ephesus Museum includes relics from a single antique city, the works are exhibited according to places where they were unearthed rather than a typical and chronological way of exhibition. To this end, exhibition halls are organized as Slope Houses and House Findings Room, The Section of Coins and Treasure, The Hall of The Funerary Relics, The Hall of Artemis, and The Hall of Imperial Cults. Besides these halls, many architectural works and sculptures are exhibited within the museum and the courtyards in harmonization with the garden decoration. Two Artemis sculptures, the bust of Eros, the statue of Eros with dolphin, the bust of Socrates are some of the worldwide known works exhibited in The Ephesus Museum. The Ephesus Museum possesses about 50.000 works in its collections. The number increases every year thanks to the ongoing archaeological excavations and donations from the local and neighbouring communities. In order to present these works to the service of scientific world and humanity sooner, 'The Hall of New Findings' has been found within The Ephesus Museum. However, this hall is not always enough for exhibiting numerous numbers of works. So, the other halls within the museum are needed to be renovated in the light of new findings according to modern museological principles. In accordance with this perception, groups of findings are being exhibited together after the last arrangements within The Hall of Slope Houses and House Findings so as to ensure the unity of theme. The hall includes many indispensable requirements in daily life from every century such as medical and cosmetic tools, jewels, weights, lighting tools; music and entertainment findings, examples to weaving tools; sculptures used in house cult and decoration, sculptures and busts of gods, goddesses and emperors, and furniture. One section within The Hall of Slope Houses is called 'Socrates Room' which is decorated with frescos, mosaics, and furniture as well as including dummies. Arasta and Bath House Section: Adjacent to the courtyard, this section, which is an integral part of the museum, exhibits commercial life in old Turkish towns, and various handicrafts that face extinction. This area can be found adjacent to the central garden of the museum. The department displays various stages of the cereal grinding process (mills), which played a significant part in agricultural local life as well as various types of copperware and beads produced to avert the evil eye. Within the section where Turkish tents are exhibited examples to old Turkish architecture and an Ottoman bath house dating back to 16th century are open to visitors. Ayasuluk Library: An old Turkish building (14th century) in the back street of The Ephesus Museum was restored by the museum, and it was designed as a small library where the public could read books and daily newspapers. The Museum for the Visually Impaired: In the Ephesus antique city, one of the restored shops in the lower Agora has been turned into a museum specific for the visually impaired. The museum consisting of two sections includes original and replica works of art. Conferences Regular conferences are organized in which mostly the archaeology of Ephesus and nearby places is discussed. Exhibitions : Modern works of art consisting of paintings, sculptures and various handicrafts are constantly exhibited in the arts gallery within The Ephesus Museum, which enables to build a bridge between antique and modern works of art, and also to convey a collection of modern works of art into the 21st century. Seminars: The Ephesus Museum organizes annual meetings in order to protect the ancient works and seminars to educate students on Ephesus and ancient civilizations. In addition, trainings and excavation assessment meetings are occasionally held by the Ministry of Culture for museum experts from all around Turkey. The idea of establishing a museum at Odemis, which is located on a fertile valley lying among the mountains Bozdaglar in the north and Aydin in the south and irrigated with Kucuk Menderes river, first emerged in 1974. The first concrete step towards that end was taken when during the 1975 - 1976 period Mutahhar Basoglu, a collector himself, donated two plots of land totalling 2772 meter square to the Treasury, to be used for a museum building. This land was allocated to the General Directorate of Ancient Works and Museums of the Ministry of Culture and Tourism on 4.1.1977 by the Ministry of Finance. The General Directorate started the construction of the museum within the same year and it was completed in 1983. Before Odemis Museum came into being, the items from the area were being kept and cared for at Izmir Archeology Museum and the Tire Museum. They were later transfered back from both museums. In order to achive chronological unity, the missing and needed archeological and ethnographic items and coin samples were selected from various museums and transferred to the Odemis Museum. The museum, which is designed in a tent form, has a basement and only one floor above it, and consists of a single hall. In the building which was originally conceived as an ethnographical museum, archeological items from the environs are also displayed in addition to ethnographic material. The displays of the archeological section are mostly from Old Bronze Age (3000 B.C) and Archaic (700 - 480 B.C) Classic (480 330 B.C), Hellenistic (330 - 30 B.C), Roman (30 B.C - 395) and Byzantine (395 -1453) periods. There are ceramics, idols, blades and axes, oil lamps, bronze pieces, glass pieces, ornaments, baked earth statuettes, and marble statuettes. There are also a total of 2545 coins in the archeological section from the Hellenistic, Roman, Byzantine, Seljuk and Ottoman periods. The ethnography section contains various weapons, copper and silver items, glass pieces, ornaments, embroderies, and costume samples, mostly belonging to the Ottoman period. There are also examples of handicrafts from the Republican period of Turkey. There is a total of 4458 items at the Odemis Museum. A group of archeological and ethnographic material was donated by the collector Muhtar Basoglu, some were purchased and other confiscated items. Located 100 km from north of Izmir in the Bakırçay river basin, Bergama is one of the Turkey's oldest civilized settlements, which has been inhabited from pre-historic times through the Ionic, Roman and Byzantine civilizations. It has yielded archeological treasures whose importance is recognized world-wide.To the southwest of Bergama, Asclepion, an important health center of the ancient world, the acropolis founded on top of a steep hill (300 m) and the Temple of Serapis (Kızıl Avlu) make this area a fascinating stop for history-loving tourists. The Altar of Zeus was smuggled to Germany in 1897. The modern day name, comes directly from its ancient name, Pergamum. Known for centuries for its monuments, it was a great city and served as the centre of Pergamum kingdom. Its location made it strategic in the Middle Ages and was the centre of the Karesioğullari Principality before it finally became a part of the Ottoman State. The city's golden era was during the reign of Attalos I and his son Eumenes II, the time when an acropolis, theatre and other important projects were completed. It was an important city in the Roman period. The city experienced many developments during the reign of Hadrian (117-138 AD), and it was adorned with Roman works of art. In the Byzantine era, after the spread of Christianity, Bergama was first under the influence of the bishopric of Ephesus, and then became a metropolis. Acropolis: The Acropolis was built on an extremely steep hill, approached by a winding road ascending some 300m. In this uniquely designed city, religious, official, social and commercial buildings are all found side-by-side. The King of Pergamum is on the top of this hill, which has been inhabited since ancient times. There are also five cisterns and an arsenal on the hill. Below these buildings is the Temple of Athena, as well as the Library and the Temple of Trajan. The Altar of Zeus was carefully placed below these buildings on a terrace. One of the steepest amphitheatres in the world is found here. The lowest section of the acropolis is the gymnasium and the Temple of Demeter. Because of the topographical location of the city and the course of the main street, all the buildings of the acropolis are lined up in a north-south fashion, but the buildings all face towards the west so that they can be seen from far away. The Altar of Zeus was not encircled with colonnades for the same reason. The Agora and Athena Temple also have an unobstructed view of the plain. The Temple of Athena: The temple columns and architrave pieces are still in Berlin. The fact that the city's most important temple is the Temple of Athena, as it is in Izmir, Milet, Eriythrai, Foca and Assos as well, reflects the religious tradition of Western Anatolia. Eumenes II had a two-storey covered walkway built along the length of the eastern and northern sides in the Hellenistic style, to commemorate his successful war against the Seleucids, Celts and Macedonians. Library: Adjacent to the sacred site of the Temple of Athena, there is the remains of the famous Pergamum library. The library, whose entrance used to be on the top floor of the gallery, dates back to the reign of Eumenes II and contains a magnificent reading room measuring 13.53 x 15.35 metres. Equipped with wooden shelves, the library also contained a 3.5m high statue of Athena, which is now in the Berlin Museum. During the reign of Eumenes II, the holding capacity of the library multiplied immensely, and its only equal in the world was the Library of Alexander. Arsenals: The military arsenal is at the north end of the acropolis, on the other side of the palaces and the Trajaneun, approximately 10m from downhill. There are five compartments, all parallel to one another. Trajaneum: The highest terrace in the acropolis, was made for the Roman Emperor Trajan, who was declared to be divine and before that, there was undoubtedly a Hellenistic structure on this site. Measured of 68 x 58 m, the temple sits perched upon a high terrace surrounded on three sides by covered promenades. Hadrian built the temple for his predecessor, Trajan, but it is known that both of the emperors were worshipped here because the colossal heads of statues of Trajan and Handrian honouring them were found here. These items are also on display in the Museum of Berlin. Theater: Built on a very steep slope, the Pergamum theatre is one of the Hellenistic period's finest architectural achievements. The steepest amphitheatre in western Anatolia, it has a capacity of 10,000 people. In Hellenistic times the stage was made of wood; set up for the performances and then taken down again.Built on a very steep slope, the Pergamum theatre is one of the Hellenistic period's finest architectural achievements. The steepest amphitheatre in western Anatolia, it has a capacity of 10,000 people. In Hellenistic times the stage was made of wood; set up for the performances and then taken down again. The Temple of Dionysos: The people of Pergamum built this very alluring temple on the north side of the 250m - long theatre terrace, specifically so that it would dominate the landscape of the area. This well-preserved temple with its beautiful profile and altar is a prostylos built upon a podium in the Ionic style. This exquisite monumental structure with its distinctively Roman understanding of art, located at the end of a long road, was a big influence on the European Baroque school of architecture. The building went under some radical changes during the Roman era. The original Hellenistic and Roman pieces are in the Museum of Berlin. The Altar of Zeus: Located about 25m below the lower terrace of the Temple of Athena, the altar was positioned at the very centre of a 69m x 77m area. It is likely that the area was open on every side so that it could be easily seen for miles around. Its reliefs are not background ornaments, but play just as important role as the altar itself. The altar, only the foundation of which is still in Pergamum, has been reconstructed and is today on display, with all of its reliefs, in the Berlin Museum. Upper and Lower Agoras: The Agoras (Forum) are terraces located on the south of the Altar of Zeus and were built in the Hellenistic period in the style of Hermes, the God of commerce. Because of the levels of the surrounding land, the covered patios are three storeys on the outside, but only one inside. The Upper Agora was once the focal point of social and commercial activities in the city, although little remains of it today. South of the gymnasium is the Lower Agora, work and homes of the common people. The main street of the city passed right through the middle of the Agora, and below is the Temple of Demeter, the place where rituals for a better after life were practiced. Gymnasiums: The magnificent gymnasium of Pergamum was located on three terraces, one above the other. Inscriptions have been found, which indicate that the first floor was for children, the second floor for youth and the top floor for adults. The Upper Gymnasium is also known as the Ceremony Gymnasium. All three of these gymnasiums were built during the dynastic period during the second half of the 3rd century BC. Asclepion: Asclepion translates as 'place of Aesklepios', the son of Apollo and the god of healing and health, and was an important health centre in Greco-Roman times. Among the types of therapy practiced here were mud baths, sports, theatre, psychotherapy and use of medicinal waters. A colonnaded street leads to the Asclepion, and to the left of the entrance is the temple of Asclepios. This domed temple with its exceptionally thick 3m walls was built in 150 AD, with donations made to the god of health. The interior side was decorated with colorful marble mosaics, and surrounded by galleries on three sides, the Aesklepion has a passageway running through the centre alongside the sacred spring towards the therapy building. It is thought that patients were cured here by the sound of running water and by the persuasive hypnotic techniques used by the priests. The Temple of Serapis: The biggest structure and best-known attraction in the town is the Kizil Avlu (Red Basilica), by a temple made of red brick dedicated to the gods of Egypt. The temple lies in what is now the modern day town of Bergama. The two pools in the temple with towers indicate ritual cleansing rites and a religious background that was neither Greek nor Roman. The fact that it faces west, and is decorated with statues in an Egyptian style, indicates that it was possibly presented to Serapis, the Egyptian god of the underworld. In the Byzantine period, it was turned into a church by extensive remodelling, especially to the apse sections, and was dedicated to the Apostle John. In early Christianity, it was one of the Seven Churches of Asia Minor addressed by St John in the Book of Revelation, who referred to it as the throne of the Devil. Although a crumbling ruin, it still contains the remains of a mosque in one of the towers. Location: 6km east of Cesme, and 80km west of Izmir. Transportation: Cesme is easily accessible by bus, and the nearest airport is at Izmir. Helps to heal: Bathing and mud treatments - rheumatic ailments, gynaecological problems and poor metabolism, problems with liver, gall bladder and pancreas. Location: 10km west of Izmir and west of Balcova, near the historical site of Agememnon. Transportation:25 km from Izmir Adnan Menderes Airport, and 10km from centre of Izmir. The closest beach is 18 km. Water temperature: Spring and well water vary between 45°C -140°C. Physical and chemical properties: Chlorine, bicarbonate, sodium, calcium, carbon dioxide and fluoride. Hyperthermal (62 °C) and Hypertonic (30.68 milimol/l.). Helps to heal: Rheumatic ailments, digestive tract, eye ailments, poor metabolism, liver and gall bladder problems and heart and circulatory conditions, and nervous disorders. Accommodation: Balcova Agamemnon Thermal Facilities (3-star) - 435 beds. Thermal Princess Hotel (5-star) - 630 beds. Location: In Cesme, 70km west of Izmir. Transportation: Well connected by bus, and nearest airport at Izmir. Helps to heal: Effective in treating rheumatic ailments, gynaecological disorders and poor metabolism. Accommodation: Turban Cesme Hotel - 420 beds. Altinyunus Holiday Village - 1030 beds.